Officials say 22 tons of kerosene and liquid oxygen were dumped on the Kazakh countryside. 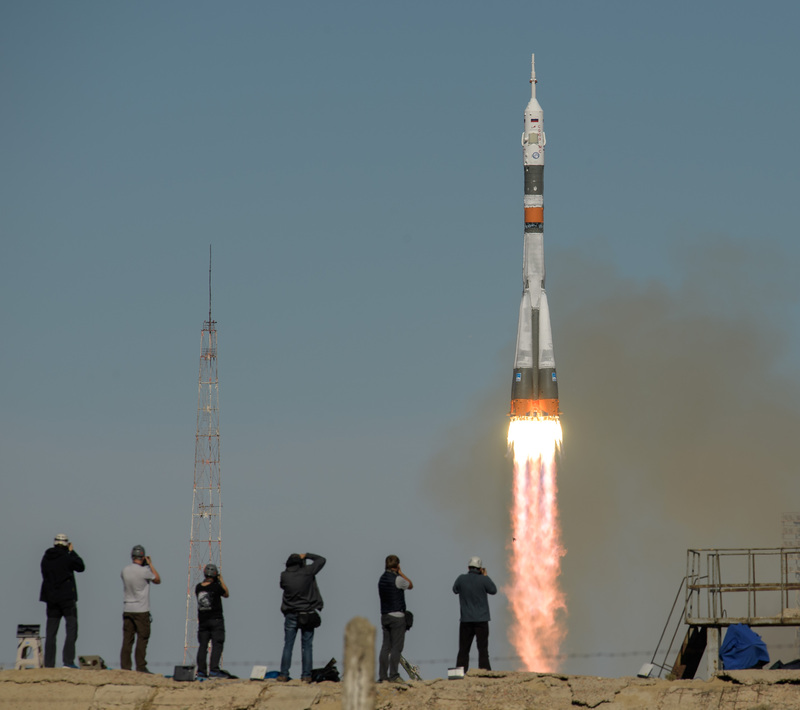 As space experts continue to investigate the causes of a recent abortive Soyuz launch from the Baikonur cosmodrome, there is still uncertainty about the possible environmental fallout for Kazakhstan. The Soyuz craft that blasted off on October 11 was meant to carry Russia’s Alexey Ovchinin and his NASA colleague Nick Hague to the International Space Station. But a few minutes into the flight, technical problems occurred, forcing the pair to effect an unplanned ballistic landing in the steppe. The latest theory for the incident, as reported by Moscow-based Kommersant, is that errors were committed during assembly in Baikonur. Senior officials with Russian space agency Roscosmos earlier stated that there may have been a collision between parts of the rocket during separation of the first- and second-stage boosters. Less attention has been paid to the fuel dumped over Kazakhstan. Russian space agency Roscosmos uses a highly toxic propellant called unsymmetrical dimethylhydrazine, or UDMH, to power its heavy-lift Proton rockets, which are used to carry cargo and satellites, and kerosene and liquid oxygen for the lighter Soyuz craft. UDMH, which is referred to by Russian technicians with the name heptyl, has in the past severely polluted parts of the Kazakh countryside. But five days after the failed launch, on October 16, the deputy head of the ministry, Marat Nurguzhin, slightly changed his tune, stating that some 22 tons of kerosine and liquid oxygen had been dumped as a result of the booster malfunction. That amount was equivalent to around 10 percent of the entire fuel load. The dump reportedly occurred from an altitude of 47 to 50 kilometers. “Kerosine is ranked in the fourth class of toxic materials, as are all oil products. So it will have no effect — there is no threat I think,” Nurguzhin said in televised remarks. In an effort to reassure, Nurguzhin said there was no also indication of elevated radiation in the affected area. But one local ecologist, Musagali Duambekov, told KTK television that even kerosine could have an adverse effect. “People’s health will suffer, lungs and skin will undoubtedly be harmed, so there is definitely a risk. I think those people who live there must be compensated,” Duambekov said. Duambekov’s remarks were heavily speculative though, and it did not appear he was basing his assessments on any on-the-ground evaluations. There was another divergent account provided from popular Russian newspaper Moskovsky Komsomolets, however. In an article published on October 17, the newspaper claimed — although without indicating the source of its information — that 820 kilograms of nitric acid and heptyl were also found where the Soyuz-FG launch vehicle crashed. An expert quoted by the newspaper said the amount of heptyl involved was “negligible,” although it is curious, if this fact were to be confirmed, that it was not alluded to by Nurguzhin. The Defense and Aerospace Industry Ministry could not be reached for comment on the claims made by Moskovsky Komsomolets. Baikonur generates occasional controversy in Kazakhstan when it is implicated in possible ecological damage, but the combination of money and prestige generated by the facility has quashed any talk of limiting activities there. Russia rents Baikonur, a legacy facility built in the Soviet Union, from Kazakhstan for $115 million per year under a lease valid until 2050. The cosmodrome spans over 7,000 square kilometers. The last serious accident to occur with a craft launched from the center was in July 2013, when a Proton rocket went off trajectory and crashed. The craft was carrying 600 tons of heptyl, amyl and kerosene. Kazakhstan estimated the harm caused at $85 million, although it is not known for certain how much Russia actually paid. Kazakh media have implied no payment was made, while Moskovsky Komsomolets, for example, suggests that Moscow managed to haggle the price down considerably. All this notwithstanding, in 2014, both countries agreed to reduce the number of Proton launches from Baikonur.